Toastmasters Speeches: An Abstract Concept-Sample Speech, "Food For The Dead"
An Abstract Concept-Sample Speech, "Food For The Dead"
Several weeks ago at the start of this month, many of us visited the cemeteries or memorial parks to observe All Saint’s Day. Unlike many people though, my family and I always choose to visit the cemetery on the second day, All Soul’s day. And the reason is to avoid the crowds and traffic. Now if you’re like us, there are only three things we bring to the cemetery for the dead. And these are prayers, candles and flowers. There was something strange that I noticed this year though. On many of the other tombstones, I saw leftover pieces of food on small plates or saucers. With many people walking and kids playing, some of these got scattered. It was gross! So there’s some spaghetti there, some biko, some leche flan and I had to carefully sidestep all these foodstuff scattered on the grass. I looked at the tombstones and read the names. No, they weren’t Chinese names. What is this? Is it a growing trend among Pinoys also? At one point, I had wished that the park management would ban bringing of food and leaving it there by the tombstones. And so this became a point of discussion among us at the cemetery. 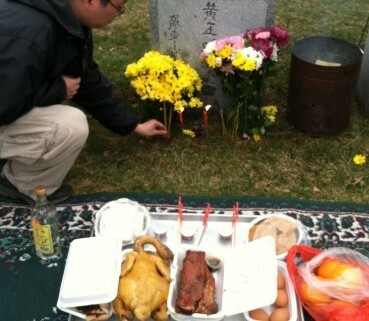 This custom of offering and leaving food for the dead as we know is practiced by the Chinese. Oh yes, the Chinese take their dead seriously. They have other offerings other than food. There is the burning of fake money and paper appliances so that their dead will live comfortably in the afterlife. According to Wikipedia.com, they even have a Festival for this, called the Hungry Ghost Festival. 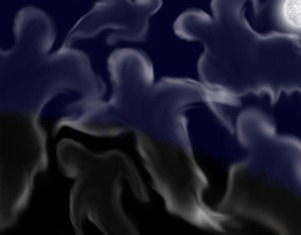 It is said that a certain time of the year, the dead ancestors would return to their houses. 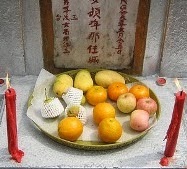 This Hungry Ghost Festival is held to honor the hungry ancestor ghosts and food and drink is put out to satisfy their needs or else something evil would happen. Do we, Filipinos have something similar? Are there any Ilocanos in the audience? I’m not an Ilocano, but I’m married to an Ilocana. My wife doesn’t bring food for the dead at the cemetery, but there is something offered to the dead and it’s called Atang in Ilocano. Anybody heard about it? An anthropologist, David William Antonio in his book “An Inculturation Model” said the following: (read passage). I remember an incident with my son last year. My son's name is Renz and it was his 5th birthday. So my wife cooked the usual treat, spaghetti, fried chicken and lumpiang shanghai. And before we started to eat, she took some spaghetti, chicken and lumpiang shanghai and put them on a small plate. She set it aside at the corner table. My son asked what it was for. And so my wife said it is for our lolos and lolas – our own grandparents. Renz didn’t know who they were. Long after dinner and before getting to bed, I saw Renz by the corner table, sulking like this. (make sulking pose) I asked what was wrong. And Renz said: “Ang tagal naman nila!”, "What's taking them too long?" I asked him what the heck he was talking about. As it turned out, he was expecting our dead grandparents to drop by and visit him on his birthday. His elder sisters were laughing and so my wife had to patiently explain the concept to him. She said that it was simply a gesture that we, the living, still remember them. It was not so much a summon for them to come and visit. But rather, it was a gesture to tell them wherever they are that they’re in our memories. We thank them that because of them we’re here and we share our milestones and our celebrations with them. And I thought that was a nice, non-scary way of telling it to a 5 year old. That was last year. And so at the cemetery, I asked my wife, “how would you feel if you were stopped from offering Atang, this food for the dead gesture.” And with that she gave me an analogy. And so by the time we were leaving the cemetery, I had changed my mind. I did not wish anymore that park management would ban leaving food for the dead. I don’t think that minor inconvenience once a year is too big a deal to break a gesture to give thanks and remember our past.